Kyle Bochniak has been rewarded for his ‘Fight of the Night’ performance with the feared Zabit Magomedsharipov back in April with a fight against another violent prospect in the shape of Hakeem Dawodu. Bochniak had a war with Magomedsharipov and earned a lot of fans after throwing down the gauntlet against a fighter who is in a different class to most featherweights. The UFC are hoping he puts on another show and Dawodu will be more than happy to oblige as he loves nothing more than to stand and trade. Fans will hope this fight stays on the feet as both men are thrilling strikers with speed to match their aggression. Expect a frenetic fight, particularly in the first round, with very high outputs. 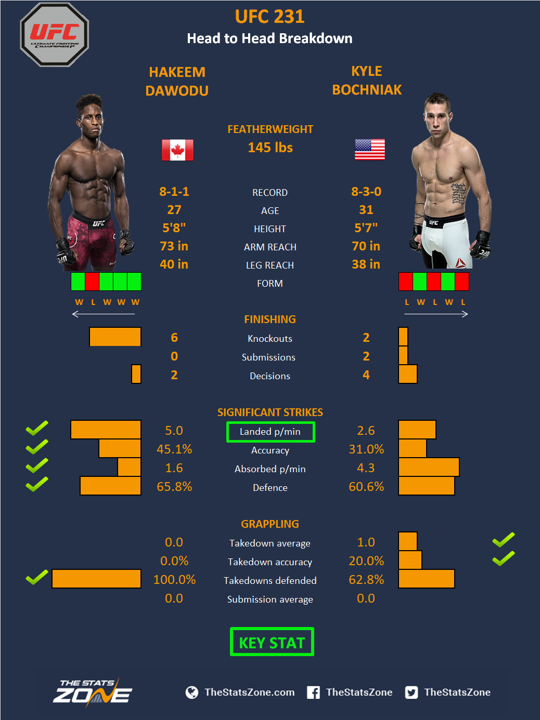 Whoever keeps the pace for the three rounds is likely to do the most damage and if Dawodu has more success, Bochniak may look to grapple after Danny Henry exploited a weakness in Dawodu’s game, forcing a submission and his first loss. However, Bochniak’s eagerness to brawl is likely to land him in trouble and Dawodu has too much speed and power to not capitalise.